We are on the second day of 5 sea days on our way to Hawaii. Sea days are always full of activities from golf putting to Baggo bean to classes of every kind. There are two different people doing photography classes and they are sharing a lot of editing techniques and iPhone/iPad tips. They are also having a photo contest. We each submitted and will see the results just before we reach Hawaii. David Smith, one of the photography lecturers, was on our previous cruise, and at the class showing the contest submissions, he always provides feedback on the submissions which is really useful. We have never won, but we learn each time. The weather has been quite rough, with waves of 25 feet. It has not bothered us but many are not feeling well and none of the venues or classes is full. Yesterday we kept up with the football scores. The games were not broadcast but Sky sports showed excerpts so we knew what was happening. There happen to be a lot of disappointed Green Bay fans on board as it turns out. Not us, we have no preference really. Well as long as Dallas is OUT we are happy. We hear they will show the super bowl in the theater though. What I miss is the Australian Open. I keep up with the scores on the internet but nothing is broadcast here. Of course, I am always rooting for Federer. Our performers for last night could not go on due to the rocking of the ship, so they showed a movie instead. And today they showed Captain Fantastic in the afternoon. Being the movie/TV junkie that I am, I went and even missed the blackjack tournament! Interesting movie. Last night was Bridget Jones’s Baby. Have to admit I nodded out in that one. Norm chose our room well. We are right in the middle of the ship so the movement is much less here than on either end. 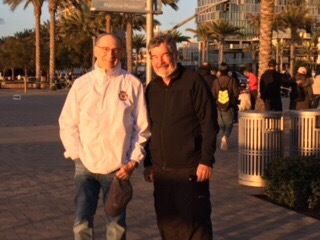 Here is a picture of Norm and Ed Beck after our afternoon visit in San Diego. We had such a good time catching up. I am continuing to work on my needlepoint and my quilt square, will probably complete the quilt square in the next day or so and will take another picture then. In the maantime, Norm has decided to do one. 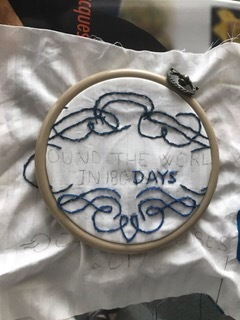 Anna, the coordinator of the project, suggested he do the Around the World in 180 days logo. So he took on the challenge. Here is his work so far. We are also doing some good reading as the library on this ship is wonderful. Our kindles are loaded and neither of us has turned them on. I am now reading All the Light We Cannot See and just finished Hillbilly Elegy. Highly recommend both. And meeting more new people every day. This morning I chatted with someone who had on a Long Beach Island sweatshirt. She and her husband vacation there, and the friends they are traveling with are from Philadelphia. Apparently there have been quite a few falls with the rocking of the ship. Every time the cruise director makes an announcement, he reminds people to use the handrails. We heard that someone fell off a stool in the casino too. They took someone off by ambulance in San Diego, don’t know the reason for that one. I have to admire the waiters, they look like they are dancing as they balance the dishes and meals. Yesterday I also missed the blackjack tournament for a great reason… the first of many hot stone massages. Just a wonderful and relaxing 80 minutes. So, all is well on this first leg of our journey. We have a special Around the World event in Hilo, hoping for sunny skies. It was to be in the Volcanos National Park, but they have had an eruption, so it will be in an event center next to the park. Stay tuned for all the details! This entry was posted in At Sea, January, World Cruise 2. Bookmark the permalink. Hope the weather improves but sounds like you are making the best if it! Weather has not been nice here and we are in the middle of a nor’easter rain event! Hope your LBI house is OK. Very impressed with Norm’s quilt square too! I also just read All the Light We Cannot see, very good!